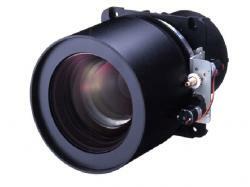 SANYO LNS-S02 professional zoom projector lens with motorized focus and zoom. Widely used for educational and presentation purposes. The lens is from the "Standard 2" series of SANYO. The lens construction is free of humidity and dust and scratches.